Sultan Daiji accepted their non-binary identity on the Transgender Day of Remembrance. “Our existences and identities are real and they hold great value. We are not delusional, irrational, unscientific, or making anything up,” Daiji said. Nearly thirty people joined the Glow Centre for Sexual and Gender Diversity on Nov. 20 to observe the Transgender Day of Remembrance (TDoR) with a vigil in the evening. 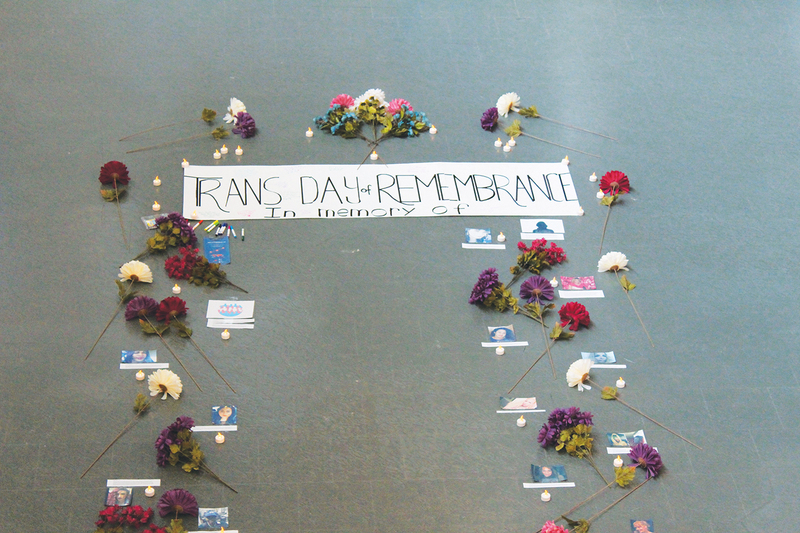 A memorial with photos of transgender people who have lost their lives was laid out in the SLC lower atrium earlier in the day to raise awareness for TDoR. TDoR brings the struggles transgender people face into the spotlight, including the extent of transphobia that still exists today. “[Transphobia] is violence at multiple levels which strives to erase identities by denying they exist to outright murder. On TDoR, it reminds me of all the levels of violence that persists and all the levels of violence we have to face which means to force us out of existence in whatever way it can, if it is not outright murder or trauma driven suicide,” Daiji said. For Lee Mousa, an english major and president of the UW Drag Club, it can be a scary time and reminded him how dangerous it still is for him to be himself. “It scares me slightly, because it also reminds me that being trans can be dangerous. Who you are can get you killed in this world … That’s why it’s important, it serves as a reminder of the cost of doing nothing,” Mousa said. For Amanda Fitzpatrick, co-ordinator of the Glow Centre, TDoR also provides an opportunity to remember transgender people that have passed, but go unreported. “[TDoR] is a really hard day for a lot of people. It’s a time where we remember not only the lives lost but the violence that trans people face on a daily basis. Its really important to have this day because, often, the deaths of trans people slip through the cracks and aren’t reported or seen on the news. Through deadnaming and misgendering by police and family members many trans deaths aren’t accurately reported, making it up to grassroots LGBTQ+ organizations to properly report them and mourn them,” Fitzpatrick said. The day began with a memorial of flowers, candles, and photos placed in the SLC lower atrium, along with a board for passerby to sign. The vigil held in the evening was a more private event, where attendees lit candles while Fitzpatrick read a list of names of people lost this year. Many tears were shed and attendees wrote confidential notes about their feelings on the day. They then returned to the Glow Centre to eat, talk, and find comfort in each other. Transgender people still face discrimination on campus. “Trans students can still face harassment from staff, faculty, and other students. They can be deadnamed and outed due to the difficult process of getting a name change on campus. We also still hear about issues at Health Services and Counselling, making it difficult for students to access necessary resources,” Fitzpatrick said. Mousa emphasizes the need for greater education on trans issues and rights, as well as representation in curricula and on campus. “It is our job to survive and thrive, it is the rest of the student body’s job to support us,” Daiji added. Despite the lack of resources on campus and the discrimination that still exists, Daiji sees hope for the future.